Toys R Us are looking for 10 new families to join their team of reviewers as Tru-Toyologists. Myself and my two boys would love to be one of the lucky families. They love toys and I love toys, what could be better. To enter we have to submit a review on their Facebook Page. 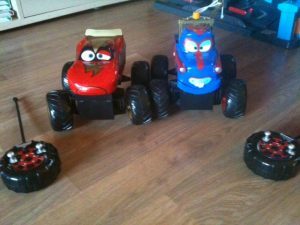 We recently got two Cars Toons Radio Control Cars, we got Frightening McMean and Mater the Tormentor. These are our newest addition to our toy collection and have been played with a lot so I thought I’d do the review on these. I certainly know they well enough, that I can now call them simple McMean and Tormey. My boys are aged 2 and 4, they can both play with these toys easily without any help. They controller is tyre shaped, which makes it chunky and easy to hold. It works with a 9V battery, which is included, first big plus point. You can steer the car forward and backwards using one lever and left to right with the other lever. The button in the middle allows you to switch it off saving the battery, but it also goes into sleep mode anyway. The best thing about the tyre controller is the little square button at the bottom which produces the Cars Toon voice. Each character says five different phases. They are funny and clearly heard. The Cars themselves work on 4 x AA batteries and again they are included, can we get a woop woop for batteries being included? If you’re a parent, you know what I’m saying here. 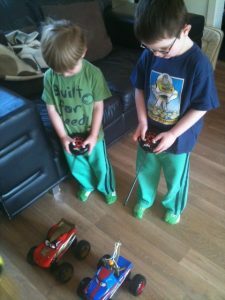 My boys truly love these cars, but, yes there is a but and it’s quite a big but, when they are played with together, one controller controls both cars at the same time. Yes very annoying and causes all sorts of arguments when they think one is controlling the other one’s car. They seem to work off the same channel and we haven’t found a way round this. Having said that, the boys are still playing with the cars and still having lots of fun. They are easy to use, chunky and seem pretty much indestructible, having being driving off the top of the stairs and hitting each one on the way down. Not a whimper was heard out of Tormey. I would highly recommend this to anyone with a fan of Cars, remote control cars or just wanting a toy to have fun with. It’s chunky and simple for little ones to use on their own, yet still has enough features to keep the older ones entertained. It can be purchased here, I got them at the sale price or £10 which I think is a great bargain. Disclaimer:- We bought these for our boys & thought I would share my honest view on these.